Brand recognition is all about being at the top of someone's mind when they make a purchase. The good news is you don't have to spend a ton of money or be a big company to make fast progress at getting your brand recognized. In this week's blog, Image is Everything - Tips for Getting People to Recognize Your Brand, we discussed 3 easy ways to get better brand recognition through consistency, predictability and simplicity. This companion issue of our newsletter provides ways to use CorpNote to achieve those goals as well as some other tips you can use in any of your internet marketing strategies. Do people know an email communication is from you just by looking at the subject line? Sending an email isn't effective if your recipient doesn't open the message. To improve your success rate, we recommend a combination of quality subject lines and sending on a regular, predictable schedule. The subject line is the first thing your recipient sees and, in that quick moment, they have to decide whether it's worth their time to read now, flag it for later or resign it to the trash bin. That is why your email subject line should clearly identify your brand and be relevant enough to prompt them to open the email. Be Brief and To the Point: Keep your subject line below 50 characters so people immediately recognize what the communication is about. Also keep in mind that many people are viewing their email on mobile devices which limits the subject line display to the first 50 characters. Identify your Brand: Use your company name, tagline or some other unique identifying phrase so people will immediately recognize your brand and be more willing to open the email. Use Peer Review: Have someone you trust outside of your business review and edit your subject lines. A quick glance by third parties can give you a much needed different and unbiased perspective. A/B Testing: Send emails with different subject lines to sample groups to see which ones garnered the best open rates as well as the best response rates. Remember, it's not just about whether the recipient opened the email but did they take the action you were hoping they would take. Don't be "Spammy": Avoid phrases and punctuation that will get your message blocked or caught in junk mail filters. Now that you have great subject lines, you need to combine it with a predictable schedule. Predictability is often missing in email campaigns but it is an essential component. People like predictability and if they know a newsletter or sales flyer is supposed to arrive in their email inbox every Tuesday (for example), they are more likely to recognize the email when it hits their inbox. Predictability takes a little bit of time to establish but, once in place, people will unconsciously start recognizing your email because they have come to expect it. Over time, if you combine quality subject lines with a predictable schedule, you are more likely to get better email open rates as well as better brand recognition. To help with predictability, create a series of eCards in advance and schedule them to be sent on a specific interval of time. This works great for weekly sales flyers, news updates and more. 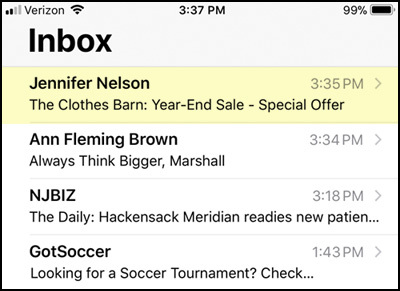 Do you make it easy for people to contact you when they receive your email? 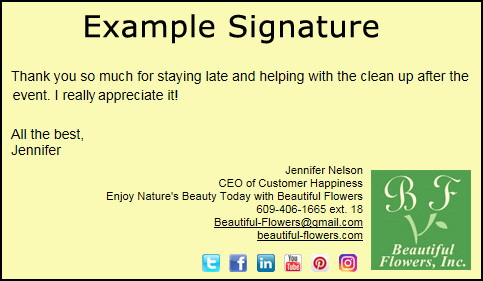 Obviously, it's important to include contact information in your signature but the specific key to brand recognition is to make sure it is consistent for all people within a company. All employees within a company should have a similar look and feel to their email signature. When setting up your CorpNote account, you can set all of the "minimum" signature items listed above as well as the items that are important for branding. Learn more in our tutorials for how to set up your signature and style preferences. Upload your logo/photo and set all of your signature options. Create a default style which is the starting point for all of your new ecards which can include your corporate color scheme. Individual users with the custom interface add-on option and multi-user administrators have the ability to customize the entire website to have the look and feel of their brand, including the graphics/colors and links. 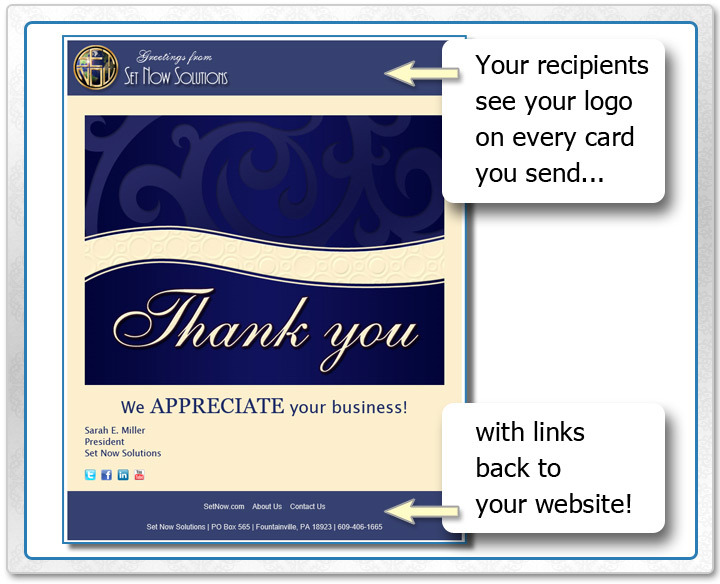 People will see this branding when they view their eCards or respond to invitations or surveys. Multi-user plan members will also see their company branding when they use their CorpNote account. Brand recognition is all about being at the top of someone's mind when they make a purchase. The good news is you don't have to spend a ton of money or be a big company to start getting your brand recognized. Here are the 3 easy ways to get better brand recognition.